I met Kathy Hanson (above), founder of Backpocket Strategy, a couple years ago when she headed up the CRAVE Minneapolis/St. Paul guide that redshoes26 design appeared in. I really connected with her, and since then, I’ve grown to respect and admire her tenacity, intelligence, enthusiasm, and humor. I recently learned that both of her kids studied overseas for a year after high school as Rotary International ambassadors, in France and Finland. So, it seems that hard work, intelligence, and enthusiasm run in the family! Hey Kathy! Tell us about you. I went to NYC right out of college, and worked at 1 Park Avenue as a graphic designer for a magazine. I loved every minute of being in NYC. I returned to Oregon to get my MBA at the University of Portland. I worked full-time while going to grad school, then had the chutzpah to march into a fantastic, local high-end printing company and tell them they needed a sales manager! I took that company from $2 million to $4 million in four years. I was hired away to do exciting freelance project-manager work for Hewlett Packard out of the Bay Area, which made me realize immediately that I loved being my own boss. I did that for five years and then moved to Minneapolis with my husband and two small kids. I told myself that if I ever wanted to open my own business, now was the time. We bought a 110-year-old farmhouse on 3 acres in Deephaven, and I opened a retail space out of my 110-year-old huge red barn, where I sold vintage homewares and clothing. It was called Pickets. My husband and I refurbished everything we sold, and we made our barn look like Anthropologie met Shabby Chic met vintage hip! I made money immediately, was on the cover of Country Home Magazine within a year, had my own segment on HGTV, and was voted Best Of by Mpls.St.Paul Magazine for Pop Up Shop/Occasional Sale. I loved every minute of it. But due to extenuating circumstances outside of my control—all sad and depressing—I had to stop the business. In a fortuitous turn, a friend gave me a copy of CRAVE, a guide to all the best women-owned businesses in Portland to get me inspired. Being Kathy Hanson, I called the publisher of CRAVE and asked “Why is there not a guide to Minneapolis/St. Paul?” to which she replied “MSP is not hip enough.” I told her I’d prove her wrong. I produced the only CRAVE guide to sell out its first edition. Not only that, but my MSP guide was the only guide in the history of the publishing company to be curated in less than a year, all while making a profit! I promised the women in the first edition I would do a second edition, and I did. In the meantime, I was hired by the publishing company to oversee six other cities because my model worked better than the other 35 city guides. This experience lead me to see clearly how many women entrepreneurs need help, outside expertise, and support. Most female business owners operate in a silo with only themselves or their spouses and friends to give advice and counsel. Most often, it’s not objective or educated advice. I was asked so many times to give advice and strategy, and often told, “I wish I had you in my back pocket all the time!” And my business name was born. In essence, I’ve been a business strategist for 25 years, and I also have 25 years of experience as a married mother of two (my kids are now ages 18 and 20) while running my own business. So I know the trials and tribulations of trying to balance it all. Tell us about Backpocket Strategy. I help male and female entrepreneurs. It can be lonely and frustrating to run your own business, and I give business owners an objective perspective to their particular issues. Not everyone can be good at everything—my clients hire me to fill in the gaps for what they aren’t good at, and to give them confidence in areas in which they need help. Entrepreneurs can’t afford a staff of experts, so my clients count on me to give them expert advice on issues they face with employees, marketing, capturing new business, finances, life/work balance…whatever issue they are struggling with at that moment in time. Sometimes I work with clients to simply figure out what they should be working on and focusing on. Our spouses/partners/friends/parents are not objective. I am an objective voice of reason and I have your best interests in mind, and I will honestly tell you the best course of action to take. I absolutely have a conviction to let women know they are not alone, they should not expect to be able to do it all themselves, they cannot possibly do it all themselves, they cannot possibly do it all themselves well, and there are ways to make their jobs easier! Who have you helped over the years? I’ve worked for and with Fortune 100 companies, small businesses, and individuals. They all served a different piece of my ego. The big companies fed my bank account and my ego because I made a huge difference financially for the businesses that hired me to fix or manage a problem. Working with small businesses is more fulfilling because I hear such personal stories from my clients, and I know firsthand that I’m actually saving someone’s sanity! I have husbands thanking me because their wives won’t listen to them or, more commonly, their wives only talk to them and they’re going insane listening to the drama about their wives’ businesses. Tell us about your videos. Two TV producers saw me at a conference where I was helping women business owners pitch their ideas to leading industry experts—textiles, cooking, paper, blogging—and they pulled me into a room and told me I was the next Suze Orman with my expertise and my wild-eyed enthusiasm for helping women entrepreneurs! Those two wonderful, giving producers have been filming my weekly two-minute videos for the past year for free. The three of us are currently trying to pitch ideas to the networks and to independent channels to prove that because of the success of Shark Tank, there are millions of entrepreneurs who could use help every day, not just asking for money from the Sharks. We shoot six videos at a time, which is really tough, and they continue to encourage me to be more “Kathy”: more irreverent, more direct to my viewers. I’m finally getting the confidence to just “be Kathy,” so watch out for my next batch! What do you wish more people would do? Realize that they cannot possibly do it all well. It’s very arrogant to think you can be left brained, right brained, great with money, and great with employees. No one is good at everything. Also, I wish every single person on earth who runs their own business would understand that they are not alone in their struggles. It’s very tough to work for yourself and have no one to vent to about what you find frustrating. What kinds of collaborations have you done? I’m asked to speak to groups of entrepreneurs all the time. I’m passionate about letting business owners know how to make well-informed decisions about their businesses. By speaking about my, my clients’, and my peers’ experiences, [I show] business owners that they aren’t alone, and that they have resources available to get answers. There is no excuse to operate in a frustrating vacuum. 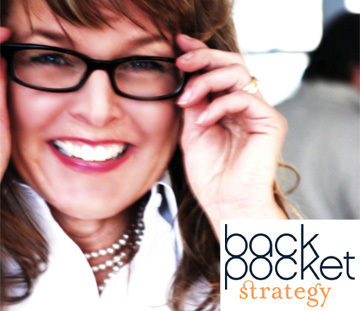 What makes Backpocket Strategy different? My 25 years of experience in the trenches as a woman in business, as a woman who owned my own successful business and as a woman who has had more than 100 business owners as clients. I bring a unique and real-world perspective to my clients that means I “get it.” I understand the challenges and I know how to resolve common issues. The other way I’m different is that most everybody who meets me thinks I inject Red Bull into my veins, and [I hear often that] my fierce passion for helping people is infectious. Who do you love to work with and why? Anyone who is curious and willing to work on achieving a better life for themselves in business. That may mean making more money, it may mean working less hours and making the same, or it could mean growing their business in a way that means they can successfully manage their limited resources of time, energy, and money. I love working with people who need an objective opinion on how to run a better business. What’s next for you and Backpocket Strategy? More exposure for my weekly two-minute videos, so I can reach more business owners. More speaking engagements so I can let more business owners know they aren’t alone. And more seminars so I can teach more business owners smart strategies for running their businesses more effectively. Will you be in the Fargo, North Dakota, area this weekend? 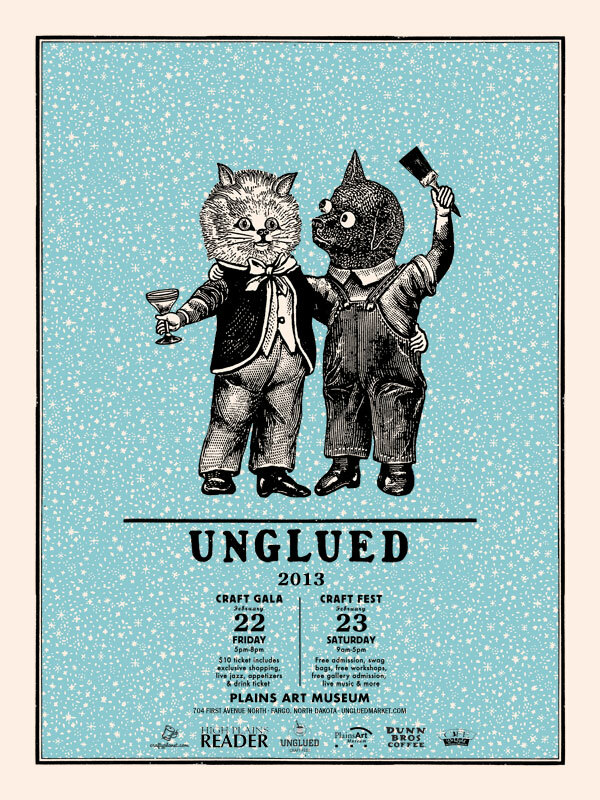 If so, swing into one of the coolest events in the Midwest, Unglued: Craft Fest. 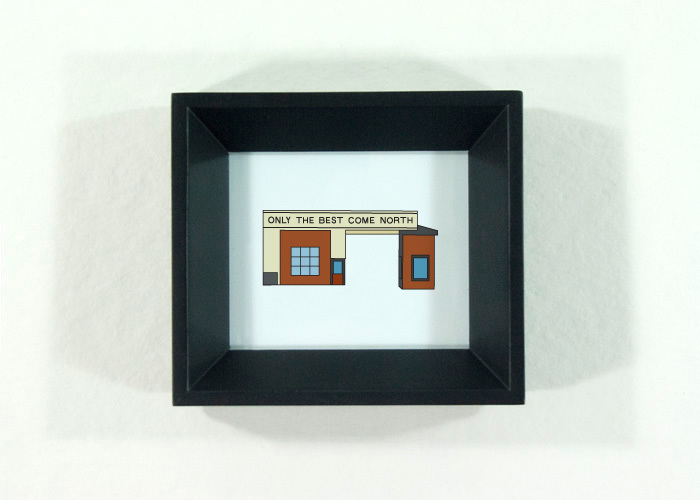 I’ve created some new North Dakota Icons just for the show, and I’ll have tons of Icons representing other states as well, plus giclee prints and greeting cards (all cards will be half off!). The 50-plus vendors will also include Larissa Loden, Michelle Brusegaard, The Elixery, Amy Jo, and Vandalia Street Press. There will also be craft demos and other entertainment. The first 150 people in the door get killer swag bags, too! Bundle up and come see us!